Red, black, and light blue native and trade pigments are all original. Evidence of native use. Not made for the trade. Height: 5 inches; Length: 10-1/2 inches. Provenance: This bowl was originally from the collection of Axel Rasmussen of Skagway, Alaska. The collection was acquired in the mid-1940s by Earl Stendahl of Los Angeles, owner of the well-known Stendahl Galleries in Los Angeles (established in 1911). 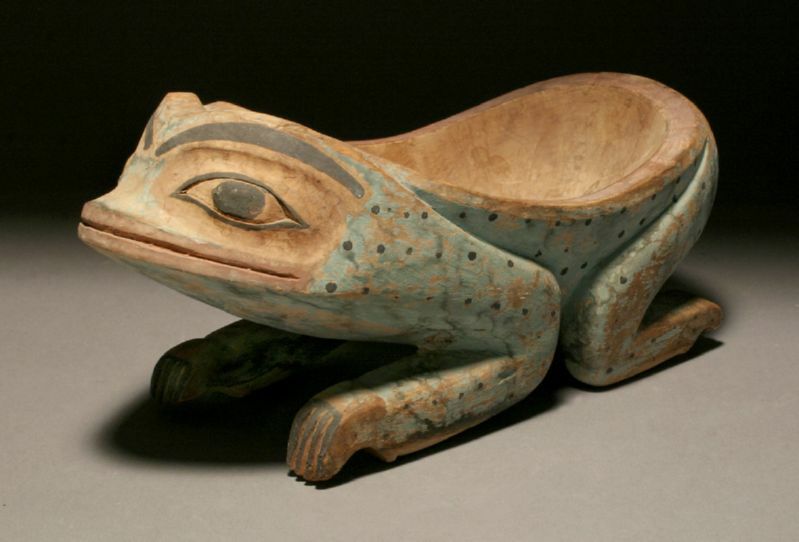 In 1947, most of the collection was sold to the Portland Art Museum (see Robert Tyler Davis in collaboration with Earl Stendahl, Native Arts of the Pacific Northwest, Stanford University Press, Stanford, CA, 1949). This object was kept in a private California home for the last 60+ years.